Traditional Malabar dishes are very popular with its uncontrollable flavours. 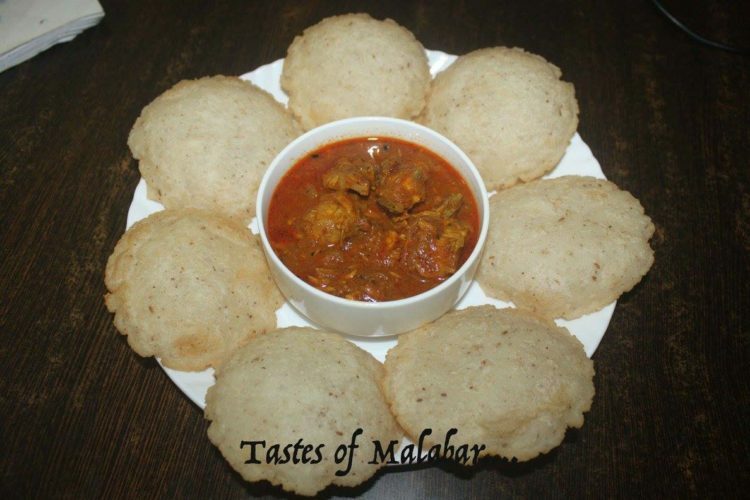 Like any other Malabar dishes poricha pathiri/ ney pathiri is one of the main and famous breakfasrt dish in Malabar area mainly in Calicut,Kannur and malappuram areas. The method of preparation is different in different area of Malabar. It is a deep fried version of rice rotti. Do try this pathiri at your home, and if anybody hasn’t tried it let me help you with this simple and easy steps. We have seen many types of pathiri, but ney patahiri is a typical deep fried pathiri/rice rotti. Poricha pathiri can be served with any gravy still usually served with nonveg side gravies like chicken,mutton and beef gravies. Finely crush coconut, shallots and cumin seeds in a grinder. Keep it aside. In a vessel boil 1 cup water with salt. When it boils add 1 cup of rice flour with constant stirring. Keep it on simmer for 1/2 – 1minutes and switch off the flame. Close the lid and keep for 5- 10 minutes. Add the crushed coconut mixture to the dough. Knead the dough well with your hands by applying water. Pathiri will be softer if you knead it when the dough is still hot. Knead it until the dough becomes smooth. Take a big lemon size ball and flatten it using your fingers by placing it on a banana leaf or plastic sheet. You can do this with a chappathi press also. It should not be too thin. Heat oil in a pan and deep fry the small pathiries like poori, till it turn light brown colour. Serve hot with any non veg curry.